Prebiotics have found their way into cat food now. I love it when you get to try a new product before you have to pay for it! PreBiotics promote healthy digestion by nourishing the good bacteria found in the digestive tract. The good bacteria crowd out the bad bacteria, resulting in healthy digestion. With solid internal health, your cat will feel healthy inside and look healthy outside. 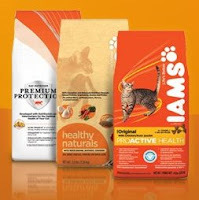 That’s the beauty of Iams ProActive Health. NOTE! Sorry, some readers are finding that no option to choose their coupon is coming up once they put in their information. Sign up to get the Iams Friends For Life newsletter, with valuable information and advice about nutrition, health, behaviour, training, and care for your cat (or dog). Plus special offers and coupons!